Malaysian Airlines Flight MH17: Who Shot It Down? While Ukraine, Russia and separatists in eastern Ukraine are all suspects, the evidence strongly points to the latter. As my colleague Ankit reported earlier today, Malaysia Airlines Flight MH17 came down near the near the town of Shakhtyorsk, in Ukraine’s Donetsk province. It was flying at its cruising altitude of 10,000 meters during a flight from Amsterdam to Kuala Lumpur. The plane crashed roughly 32 km from the Russian border. It seems nearly certain that the plane was shot down rather than crashed due to mechanical failures or negligence on the part of its pilots. It also seems nearly certain that the plane was shot down by accident as none of the possible perpetrators had any motive to intentionally down a civilian aircraft. Some in the Ukrainian government have (naturally) accused pro-Russian separatist rebels in eastern Ukraine of having shot down MH17. In many ways, they are indeed the party that is most likely to have been behind the incident. The rebels have made a habit of targeting Ukrainian military aircraft flying over the areas they control or are contesting. Given their presumably limited intelligence capabilities, they are also the party most likely to have mistaken the civilian jet for a military one, which clearly whomever shot down MH17 did. This is especially true when one considers that the plane was flying from west to east; in other words, was flying from Ukrainian airspace and towards Russia (or eastern Ukraine). There is other potentially devastating evidence implicating the rebels and their supporters. Most notably, a video posted on You Tube today purportedly shows smoke rising from the site of the crash shortly after it happened. According to Foreign Policy, villagers in eastern Ukraine who are presumably loyal to the rebels are celebrating the crash in the video, with one village saying “It burns beautifully.” Similarly, Ankit has pointed me to a Tweet showing a screenshot of a news report from earlier today in which the rebels in eastern Ukraine claim credit for shooting down a Ukrainian military transport plane. The report has since been taken down, but it lends credence to the theory that the Ukrainian rebels shot down MH17 because they mistook it for a Ukrainian military aircraft. The biggest question mark for the Ukrainian separatists’ involvement is whether they had the capabilities to shoot down the plane. 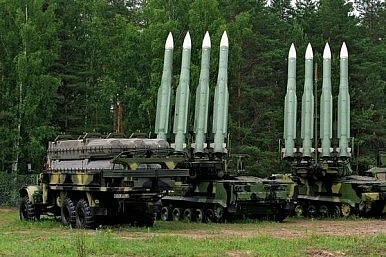 As Stratfor notes, “Based on altitude of flight, only medium- to long-range surface-to-air missiles could have shot down the civilian aircraft.” The Ukrainian separatists have denied shooting down the plane, arguing that they only possess man-portable air-defense systems which would not be able to target planes flying at 10,000 meters. However, the Ukrainian government has said that a BUK-M1 [aka SA-11] surface-to-air road mobile missile system (pictured above) was used to shoot down the plane, and that Russia has provided this system to the pro-Russian separatists in eastern Ukraine. An Associated Press reporter on the ground in eastern Ukraine claims to have seen rebels in the area with the Buk system, which can shoot down planes flying at an altitude of as high as 22,000 meters. Even if pro-Russian separatists in eastern Ukraine aren’t responsible for shooting down the plane, it’s possible that Russian forces themselves shot it down. Russia has once again been massing troops at the border with Ukraine in recent days. Ukraine has said that a Russian air-to-air missile shot down one of its Sukhoi-25 jets on Wednesday, and that a surface-to-air missile had been fired at another Suk-25 jet from inside of Russian territory on the same day. Kiev also claimed on Monday that a surface-to-air missile fired from inside Russia had downed a military transport plane. The fact that the plane was flying towards Russia from Ukraine also means that Moscow could have mistaken the civilian plane for a hostile aircraft. However, Russia presumably has better ISR capabilities than the rebels, and thus would have been less likely to mistake MH-17 for a Ukrainian military aircraft. Moreover, Moscow has denied all of Ukraine’s accusations regarding the Su-25s and military transport plane, and Ukrainian rebels have in fact claimed responsibility for all three incidents. Finally, it’s possible that Ukraine shot down the aircraft because it mistook it for a Russian military aircraft flying inside Ukraine. Some claim that the Ukraine government had declared the airspace above parts of eastern Ukraine an “anti-terrorist operation” zone and demanded that all civilian aircraft fly over it only at altitudes higher than 7,900 meters. It’s not clear if this is accurate. In any case, MH-17 was flying well above that altitude when it was shot down, but it’s possible that Ukrainian officials misread the plane’s altitude. This seems like highly unlikely, however. Moreover, as already noted, the plane would have been flying toward Russia, making it even less likely that the Ukrainian military or government would have ordered that it be shot down. This is especially the case since Ukraine hasn’t been shooting down aircraft in the ongoing conflict. Ukraine has also called for an international investigation into the crash, something that it would be unlikely to have done so quickly if it had any doubt about whether it was the side that shot down the jet. Thus, the most likely scenario is that pro-Russian separatists in eastern Ukraine shot down the jet using Russian supplied anti-aircraft weaponry, or else that Russia itself shot the plane down. In either case, the plane being shot down bodes poorly for Russia, and even worse for its supporters in eastern Ukraine. The plane being shot down will galvanize the international community to both increase support for the Ukrainian government’s efforts to defeat the rebels, as well as increase pressure on Russia to cease giving support to the rebels in eastern Ukraine. Malaysian Airlines Flight MH17 Shot Down Over Donetsk, UkraineWhy Russia Might Have Provided the BUK Missile LauncherMalaysian Airlines Flight MH17: What If Russia Wasn’t Involved?The Geopolitics of Malaysian Airlines Flight MH17Crimea: When Is an Annexation Not Actually an Annexation?